An experienced runner seeking improved performance? An injured runner, or a runner with a history of running injuries? A triathlete, searching for that improved run split? Or a runner simply trying to remain injury-free and improve your performance, all at the same time? RunSmart is designed for you. The scientific research on running injuries indicates that the primary cause of injury in runners is quite simple - poor and out-dated training methods. Unfortunately, there is a significant incongruity between the current sports sciences research and the current beliefs and applications by athletes, coaches, and healthcare providers. The clinic: A four hour clinic that presents the RunSmart program. A copy of the book is included in the registration fee. Please refer to the "Seminar Registration" link for more details. 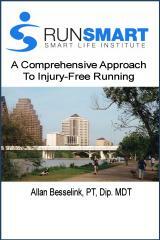 Private consultation: Your own individualized RunSmart consultation. This can include video analysis and program development dependent upon your needs. Please contact Allan Besselink at 512-914-0871 for further details.